Former law enforcement officials told the Times that Rosenstein’s request is troubling. “It’s flat-out wrong to have career federal prosecutors engaged in a political process like the vetting of a Supreme Court nominee. It takes them away from the mission they’re supposed to be fulfilling, which is effective criminal justice enforcement,” Christopher Hunter, a former F.B.I. agent and federal prosecutor for almost 11 years, told the publication. But Michael Zubrensky, a former Justice Department lawyer who oversaw the agency’s Office of Legal Policy, said Kavanaugh’s long paper trail could be the reason for Rosenstein’s request. Sarah Isgur Flores, spokeswoman for the Department of Justice, told the Times that prosecutors have been used in the past to vet Supreme Court nominees. “[T]he scope of the production of executive branch documents we’ve been asked for is many, many times as large,” she said. Rosenstein also wrote that he would need the equivalent of 100 full-time attorneys to work on the nominee’s confirmation hearing. As The Hill notes, Kavanaugh previously worked for President George W. Bush’s administration, as well as for the investigation led by Kenneth Starr of former President Clinton. He left a lengthy paper trail that Democrats and outside groups opposed to his nomination are likely to search through for arguments against his confirmation. 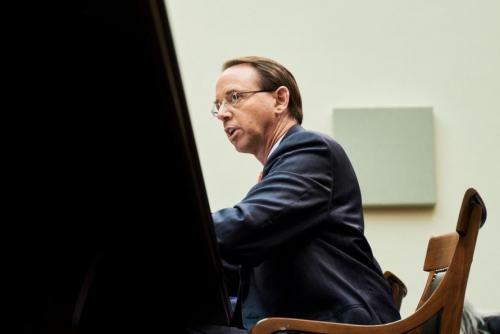 Rosenstein has faced pressure from congressional Republicans over his role in overseeing special counsel Robert Mueller’s investigation. Democrats have raised the Mueller probe in the context of Kavanaugh’s nomination, arguing that he should not be confirmed because he could end up making decisions on the probe itself.